Beaches Victoria - Outdoor Activities in Victoria, B.C. Considering Victoria is found at the southern tip of an island, it should come as no surprise that the city possesses a number of fantastic beaches to visit. Some are a few minutes’ walk from downtown, while others offer a secluded paradise off the beaten track. During the summer especially, locals and visitors alike flock to Victoria’s beaches to bask in the sun, enjoy the ocean, and spend time with friends and family outdoors. 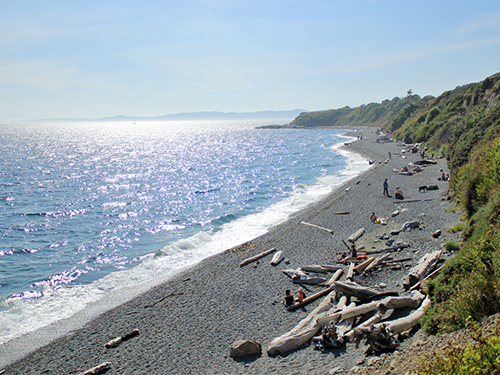 Check out some of Victoria BC’s best beaches below! This beach, just ten kilometers outside of downtown Victoria is a sand and pebble paradise on warm summer days. Nearby seaside cottages, restaurants and other amenities make it a popular place for visitors to the area, and those looking to spend an afternoon without having to pack absolutely everything along with them. There are several public access points, making a beach escape an easy feat. Paired with stunning views and pristine waters, Cordova Bay is the perfect beach destination. Cadboro Bay and Gyro Beach make up what is known as the Cadboro-Gyro Park in Victoria BC. With a kids playground on land, and a soft sandy beach below, it has everything you need for a day at the beach. With an expanse of lawn for a picnic blanket and shade, sheltered waters for young swimmers, bathrooms and picnic tables, plus the Cadboro Bay Village nearby, it’s the ultimate afternoon destination for families. 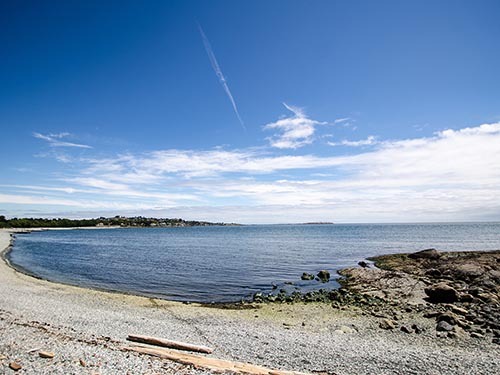 Willows Beach in Oak Bay has proven to be one of Victoria’s most popular beaches. It has about 1.2 hectares of sand, meaning plenty of space for fun activities. Both locals and tourists flock to Willows in the summer for sunbathing, beachcombing, swimming, kayaking and sightseeing. The Discovery Islands and Mount Baker can be seen from Willows Beach on a clear sunny day. While there aren’t as many sandy spots off of the Dallas Road Walkway, it still loops its way next to the ocean and offers outcrops if you know where to find them. There’s also the popular stop-off at the end of Cook Street, where dogs are allowed off leash year-round. The other beaches off of Dallas Road are split into private coves by rocky outcrops and can be a bit more challenging to get to. Once you’re there, however, you can expect to have it mostly to yourself, as most people will wander through and find their own slice of paradise off of the walkway. It’s a great spot to watch freighters go by, and to gaze out at the stunning Olympic Peninsula. Tucked into a sheltered bay down a set of stairs, Gonzales Beach is a small bay of beautiful sand, calm waters and stunning views. Ideal for first-time stand up paddle boarders, families and those seeking to soak up some sun in peace, Gonzales Beach will make you forget your just outside a bustling downtown. Located just off of Sidney Island, a tiny Gulf Island across from the town of Sidney, Sidney Spit is the ultimate expanse of beachy escape. 5km of sand stretch into the sea, offering the perfect place to enjoy a walk, sunbathe, swim or paddle. Accessible by ferry from Sidney, many adventurers make a day out of it and kayak from the small town just outside of Victoria BC. For a day trip escape to a private beach, Sidney Spit is the perfect destination. It even has everything you’ll need from drinking water and toilets, to a campground and hiking trails.